Show that you support someone who is battling Epilepsy when you attach this eye catching Epilepsy Awareness Key Chain to your keys. Whether you are supporting your child, grandchild, niece, nephew or friend, everywhere you go you’ll always be helping to raise awareness. Great product. Encourages people ask about it and helps spread awareness. Thank you! Additional Info Here at MyWalkGear.com, we understand the need for concern and awareness about Epilepsy so we have created a unique collection of Personalized Epilepsy Shirts and Walk Gear for you to join in and help support this condition. With our collection of Epilepsy Awareness Gear, you can help support anyone you want, whether it be a family member, friend, co-worker or to just help the community to raise awareness. 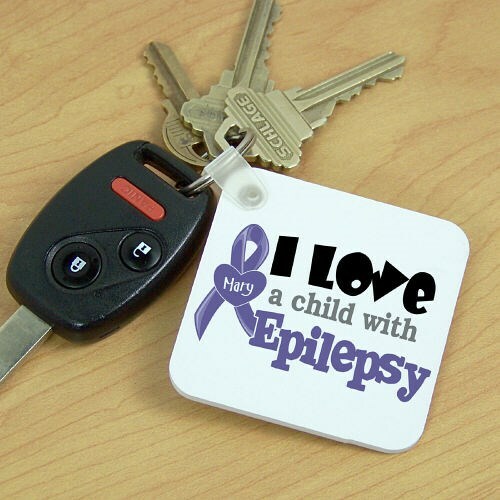 Show your support today with this great awareness keychain along with our Personalized Epilepsy Awareness Hoodie or our Personalized Epilepsy Awareness T-Shirt.